Prescribes policies and procedures for the conduct of logistics, maintenance, materiel readiness, strategic mobility, and sustainment support in the DoD, to include, supply, maintenance, and transportation. Advises and assists the USD(A&S), SECDEF, and DEPSECDEF in providing guidance to the Secretaries of the Military Departments with respect to logistics, maintenance, materiel readiness, strategic mobility, and sustainment support in the DoD. Monitors and reviews all logistics, maintenance, materiel readiness, strategic mobility, and sustainment support programs within the DoD. Participates in the DoD Planning, Programming, and Budgeting System with respect to assigned areas of responsibilities. Performs other duties that may be prescribed by the USD(A&S), DEPSECDEF or SECDEF. Exercises authority, direction and control over the Director of the Defense Logistics Agency. Coordinates and exchanges information with officials of the DoD Components and other Federal Agencies, whenever practicable, to achieve maximum efficiency. 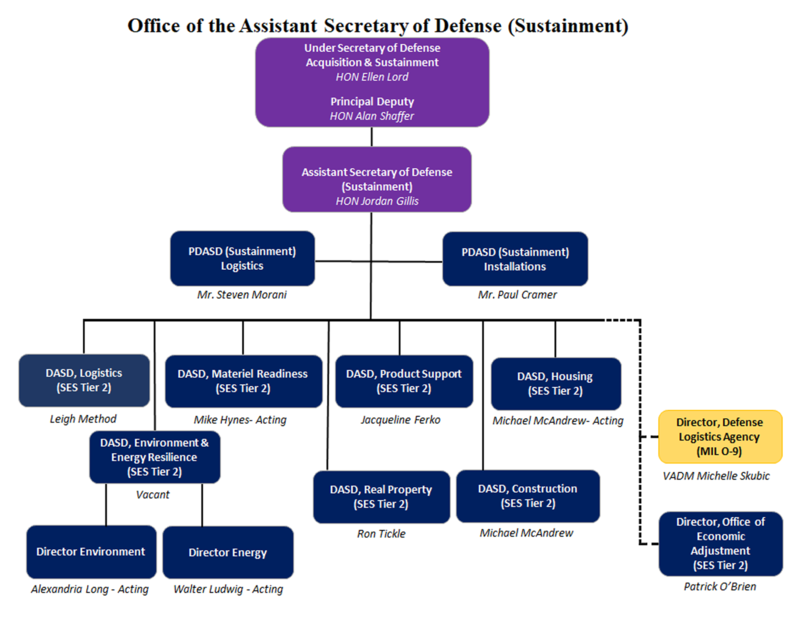 Other OSD officials and the Heads of the DoD Components coordinate with the ASD(Sustainment) on all matters related to the authorities, responsibilities and functions assigned by DoD Directive 5134.12. Issue DoD Instructions, DoD Publications, and one-time directive-type memoranda, consistent with DoD 5025.1-M, that implement logistics policies and procedures for the functions assigned to the ASD(Sustainment). Instructions to the Military Departments are issued through the Secretaries of the Military Departments. Instructions to the Combatant Commands are communicated through the Chairman of the Joint Chiefs of Staff. Obtain reports, information, advice, and assistance, consistent with DoDD 8910.1, as necessary in carrying out assigned functions. Communicate directly with the Heads of the DoD Components. Communications to the Commanders of the Combatant Commands shall be through the Chairman of the Joint Chiefs of Staff. Establish arrangements for DoD participation in non-Defense governmental programs for which the ASD(Sustainment) is assigned primary staff cognizance. Communicate with other Government Agencies, representatives of the Legislative Branch, and members of the public, as appropriate, in carrying out assigned functions.